Poet, physician, lutenist and composer Thomas Campion. You’d never guess from the sober-looking portraits, but Queen Elizabeth I of England was an enthusiastic dancer. The Virgin Queen or Good Queen Bess (as she was also known) held the view that dancing was excellent physical exercise and seventy musicians were employed at the royal court, not merely to provide dance music but to supply instrumental and vocal music for various court occasions. Like her father Henry VIII, Elizabeth had musical ability and could play the lute and the virginals. She expected that everyone else should be capable of doing the same. Among the wealthy classes, musical literacy and the ability to play an instrument or sing at sight were essential social skills. Those who lacked them were regarded as uncultured laughing-stock. Elizabeth I reigned between 1558 and 1603, a period sometimes called The English Renaissance. It saw a flowering of drama, literature, poetry and music as never before. Those were the days of Edmund Spenser, Sir Philip Sidney, Christopher Marlowe, William Shakespeare and Ben Jonson. The most well-known composers at the time were William Byrd, Thomas Morley, Thomas Campion, John Dowland, Orlando Gibbons, and Thomas Tallis. In 1601, Thomas Morley published a collection of twenty-five madrigals specially written by different composers in honour of the Queen. It was called The Triumphs of Oriana and each madrigal ended with an identical couplet praising the queen. The early seventeenth century saw an increasing number of music publishing houses both in Britain and continental Europe to supply much-needed printed music to an affluent and ever-growing market. The composer and lutenist John Dowland owed much of his success to publishing and his songs were as popular as those of Bob Dylan in the 1960s. His First Booke of Songes and Ayres appeared in 1597 and became a bestseller. Dowland produced three more songbooks in the 1600s and he became associated with melancholy themes of love and longing that were so popular during Elizabethan times. John Dowland is best known today for his songs such as Come, heavy sleep, Flow my tears, I saw my Lady weepe and In darkness let me dwell. During the mid-twentieth century his songs and instrumental music underwent a major revival. 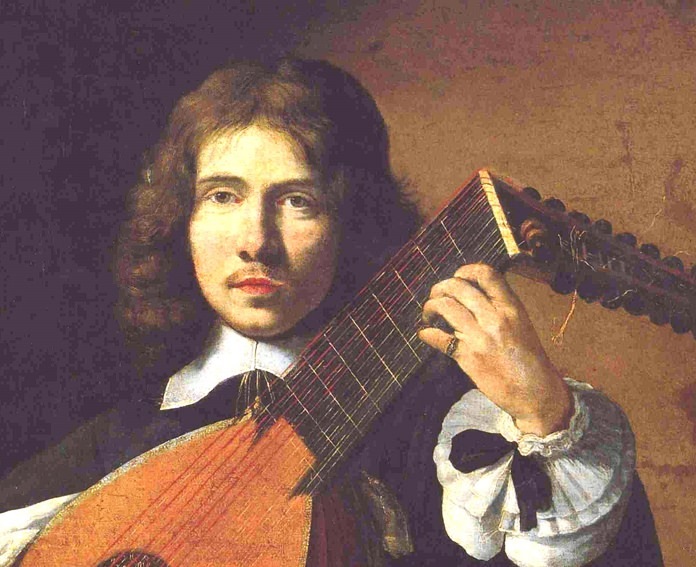 Today, most classical guitarists will have a few Dowland numbers in their repertoire, transcribed from the original lute scores. Despite the incessant gloom that pervades his songs, Dowland was not a self-pitying individual though he was evidently rather sensitive and prone to bearing grudges. Musically he was reflecting the sensitivities of the time when a melancholy nature was considered a sign of a superior individual. Queen Elizabeth I would almost certainly have played or sung some of Dowland’s earlier pieces herself, though Dowland was never appointed to Elizabeth’s Protestant court. He claimed the reason was his Catholic religion, which seems a reasonable enough excuse. Dowland did little to discourage his reputation as the great melancholic, punning on his own name in a piece called Semper Dowland, Semper Dolens (“always Dowland, always doleful”). The work appears in a collection of twenty-one instrumental pieces entitled characteristically Lachrimae, or Seaven Teares scored for five-part viol consort and lute. At the time, the viol was the most popular family of bowed instruments. Much of the music is melancholy indeed, even the faster dance numbers, but it has a strange beauty that somehow speaks of another age. The multi-talented Thomas Campion was well-known as a poet and songwriter who composed over a hundred lute songs and masques for dancing. While still a young teenager, Campion’s step-father packed him off to Cambridge University. But after spending four years there, he left without a degree for some reason and entered London’s Gray’s Inn to study law. Another change in career plans took him to Caen in north western France where he studied medicine, receiving his medical degree in 1605. He finally moved back to London, where he worked as a physician. It is pleasing to think of him humming snippets of his songs as he poked around examining his patients. His first book of poetry appeared in 1591 and his first songbook in 1601 so Elizabeth would almost certainly have been familiar with his early works and could well have performed some of the songs herself. But not this one. The song comes from Campion’s a song book which appeared around 1613, ten years after the queen’s death. Campion was also highly knowledgeable in music theory. In 1615, he published a technical book crisply entitled A New Way of Making Foure Parts in Counterpoint by a Most Familiar and Infallible Rule. For many years, it was the standard textbook on counterpoint, though it probably didn’t contain many jokes.